Ground Penetrating Radar Systems, LLC. of Phoenix, Arizona was contacted by a local General Contractor that was using an existing office and turning it into a building for a storage company. The general contractor on this project was in the planning process of this project and needed to have all of the rebar and post tension in the concrete beams identified so they could see if the building is strong enough to hold the new storage units. This particular building was constructed with multiple concrete beams that were filled with post tension cables, as well as pre-cast slabs with post tension and rebar running in the T’s. 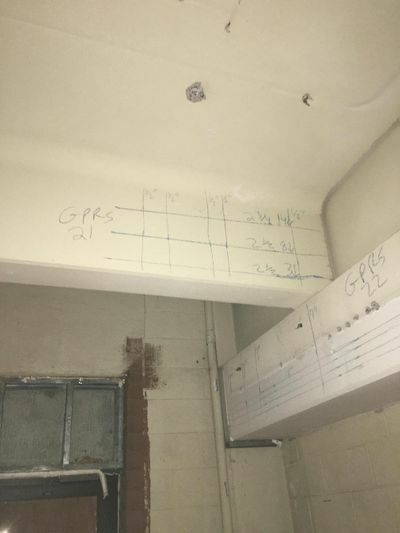 GPRS was able to come out and scan a majority of the T beams that made up the building to see if there is enough support for the heavy storage unit containers. We identified all post tension cables that were in the slab as indicated by the image below. This gives the contractors a clear image of what is located in the slab so they can take this to the building engineer and confirm the building is prepared for the newly added weight. Ground Penetrating Radar Systems, LLC. specializes in ground penetrating radar service as well as private Utility locating. With that in mind, the amount of experience and specialization of concrete imaging and utility locating as well as a nationwide network of technicians; GPRS, LLC. is unrivaled in the industry. GPRS, LLC. can supply your project with the safest and most accurate ground penetrating radar service in the business. Your safety and job effiency is our main goal at Ground Penetrating Radar Systems, LLC. We are the experts in GPR. If you are interested in learning more about our concrete imaging capabilities or other Ground Penetrating Radar applications such as locating Utilities and sub-surface anomalies along a proposed pipeline trench, locating Underground Storage Tanks (USTs), clearing boring locations of possible Utilities for soil samples, Void Detection or even structural investigations. Don’t hesitate to contact us for more information or to hire us for your next project no matter how big or small the project may be. Ground Penetrating Radar Systems has an office local in Phoenix serving all of Arizona as well as having offices all across the U.S in all major cities and states. Please feel free to contact Troy Bullock with the Phoenix office at (480) 227-8614 or email him at troy.bullock@gprsinc.com.